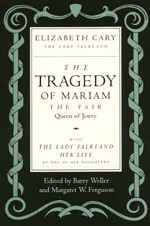 The Tragedy of Mariam (1613) is the first original play by a woman to be published in England, and its author is the first English woman writer to be memorialized in a biography, which is included with this edition of the play. Mariam is a distinctive example of Renaissance drama that serves the desire of today's readers and scholars to know not merely how women were represented in the early modern period but also how they themselves perceived their own condition. With this textually emended and fully annotated edition, the play will now be accessible to all readers. The accompanying biography of Cary further enriches our knowledge of both domestic and religious conflicts in the seventeenth century. Barry Weller is Professor of English at the University of Utah and editor of the dramas in The Complete Poetical Works of Byron. Margaret W. Ferguson is Professor of English at the University of Colorado and author of Trials of Desire: Renaissance Defenses of Poetry (1983).